Officially, they are known as family residential centers where ICE detains a few thousand migrants parents with their children in three facilities. Two are in Texas and one is in Pennsylvania. The U.S. Department of Homeland Security is looking to add as many as 15,000 beds to detain migrant parents and their children together. Proponents of expanded family detention say it’s a solution that allows the government to process immigration cases quickly and keeps families together. Critics point to studies on the adverse effects of detention on children and say a better solution is to invest in improving the immigration court system. U.S. Rep. Kyrsten Sinema, the Democratic nominee for Arizona’s open U.S. Senate seat, thinks family detention centers are not sustainable and alternative programs are more effective, while her Republican opponent, U.S. Rep. Martha McSally, sees the lack of them as a loophole exploited by human smugglers, according to information shared by both campaigns with the Arizona Mirror. Officials from DHS, the Department of Justice and the U.S. Department of Health and Human Services are also advocating withdrawing from the Flores decree, thus opening the door to increased family detention. Both McSally and Sinema have backed legislation that would reform legal and illegal immigration and increase funding for border security. McSally was behind the Border Security and Immigration Reform Act, which failed in the U.S. House in June. 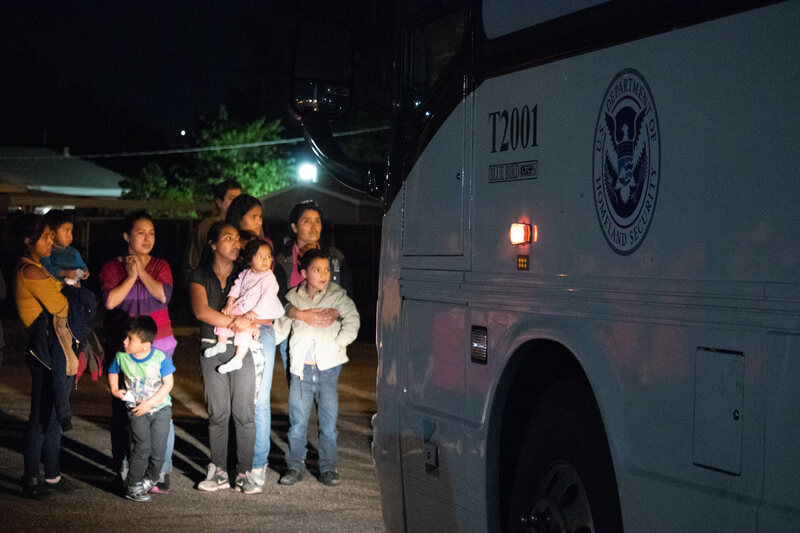 The bill would have reformed the asylum process, eliminated some family-based and employment-based visas and, among other things, made it easier to detain children with their parents. “There exists no presumption that an alien child who is not an unaccompanied alien child should not be detained,” the bill said. It would have allowed the indefinite detention of migrant children and families. McSally also backed another bill, the Securing America’s Future Act (which also failed in the House in June) that would have given DHS broad discretion to detain and deport children accompanied by a parent, according an analysis by the National Immigration Forum, a nonpartisan group that advocates for comprehensive immigration reform. During the only televised debate between the candidates earlier this month, McSally said she rejects family separation, but thinks current system of handling families is flawed and exploited. Sinema said parents and children need to be monitored and their immigration cases adjudicated more quickly. She supports more funding for the backlogged immigration system that would allow families to be processed quicker and outside of detention. A Sinema campaign spokeswoman said the Flores decree is there to protect the safety of children. In January, Sinema backed the USA Act, which bill would increase the number of immigration judges by 55 each year from fiscal years 2018 through 2020. Immigration trends point to more parents choosing to migrate with their children. Fiscal year 2018 reached a new record with 107,212 total migrant family members arrested between ports of entry on the southern border. Data from Customs and Border Protection also shows parents traveling with children account for an increasing share of total apprehensions. In 2013, migrant families made up 9 percent of the total immigration arrests made by Border Patrol on the southern border. In 2018, families made up 27% of all apprehensions, according to CBP data. In recent weeks, ICE has released hundreds of migrant families to community churches in Phoenix, Tucson and Yuma, saying a surge of families coming to the border has limited the government’s capacity to hold them without infringing on limits on how long minors can remain in custody. Yet, the figures for illegal immigration are a fraction of numbers observed from the 1980s through 2008. People caught crossing the border illegally reached more than a million in 1983 and the arrests recorded generally held steady (it peaked in 2000 with 1.6 million arrests) until the number fell to about 700,000 in 2008. Apprehensions have since fluctuated between 300,000 and 540,000, with fiscal year 2017 arrests reaching the lowest in more than four decades at 303,916. While overall apprehensions dropped 30 percent in 2017 compared to the year prior, arrests of family units only dipped by 3 percent. The highest jump in number of families arrested at the border happened in 2014, when the total number of families arrested year-over-year increased by 361 percent, and the month of June 2014 alone had more arrests of families than all of fiscal year 2013. Senior government officials have said it is more effective for the government to prosecute the families if they’re in detention. The average adjudication of cases for immigrants in detention is 40 days, compared to 452 days for those processing their cases outside of detention, according to Joseph Edlow, acting deputy assistant attorney general for the DOJ. However, detention is more costly. An Government Accountability Office report from 2014 showed that the average daily cost of detention is $158 per person, while the a common parole-like program used for migrant families, called the Alternatives to Detention, had an average daily cost of $10.55.